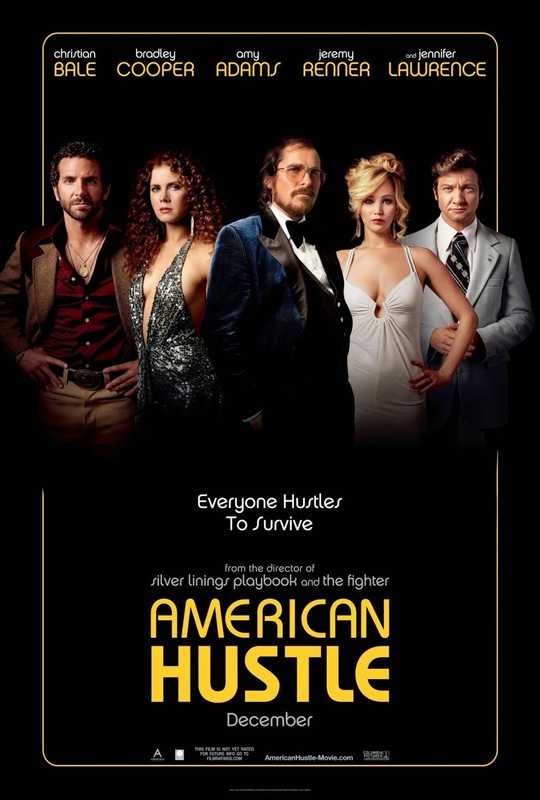 Film Review: "American Hustle" (2013). The trailer asks a question "Did you ever have to find a way to survive and you knew your choices were bad, but you had to survive?” This is asked in American Hustle. This American crime film directed by David O. Russell, from a screenplay written by Eric Warren Singer and Russell, loosely based on the FBI ABSCAM operation of the late 1970s and early '80s. A con artist, Irving Rosenfeld, along with his seductive partner, Sydney Prosser, is forced to work for a wild FBI agent, Richie DiMaso, who pushes them into the world of Jersey to set up an elaborate sting operation on corrupt politicians, including the mayor of Camden, New Jersey. The film is described as a "fictionalization", rather than a straight adaptation of the events which the film is based upon. The opening screen states, "Some of this actually happened." The film is loosely based on the 'Abscam' Operation. 'Abscam' was a Federal Bureau of Investigation (FBI) sting operation run from the Bureau's Hauppauge, Long Island, office in the late 1970s and early '80s. The operation initially targeted trafficking in stolen property but was converted to a public corruption investigation. The FBI, aided by a convicted con-man, videotaped politicians as they were offered bribes by a fictional middle-Eastern sheik in return for various political favors. The investigation ultimately led to the conviction of a United States Senator, six members of the United States House of Representatives, one member of the New Jersey State Senate, members of the Philadelphia City Council, the Mayor of Camden, New Jersey, and an inspector for the United States Immigration and Naturalization Service. The film's main characters; Irving Rosenfeld, FBI Agent Richard "Richie" DiMaso, Sydney Prosser, Mayor Carmine Polito and Rosalyn Rosenfeld were based upon the real-life figures; Melvin Weinberg, Anthony Amoroso, Jr., Evelyn Knight, Angelo Errichetti and Cynthia Marie Weinberg. It stars Christian Bale and Amy Adams as two con artists. Who are then forced by an FBI agent, played by Bradley Cooper, to set up an elaborate sting operation on corrupt politicians. Including the mayor of Camden, New Jersey, played by Jeremy Renner. Jennifer Lawrence plays the unpredictable wife of Bale's character. Bale and Adams gave intense and emotional performances, especially Adams which explains why she so deserved to win a Golden Globe and an Academy Award nomination. Cooper gave his most raw and comical performance since Silver Linings Playbook (2012). Renner gave a great performance in his first non-commercial film. Lawrence also gave an equally intense and comical performance as Adams and Cooper. Which is also why she too deserved a Golden Globe and an Academy Award nomination. Hard-hitting and stylish, American Hustle is the crime film of the year – and arguably one of the high points of David O. Russell's career. The film is so absorbing that whenever it cuts away from the plot, there is another, better plot to cut to. However, there moments where I found it irratating rather than interesting. But it's sly, with a biting sense of humor and emotionally satisfying elements. I suppose the film is worth every cent. Also, see my review for Silver Linings Playbook. 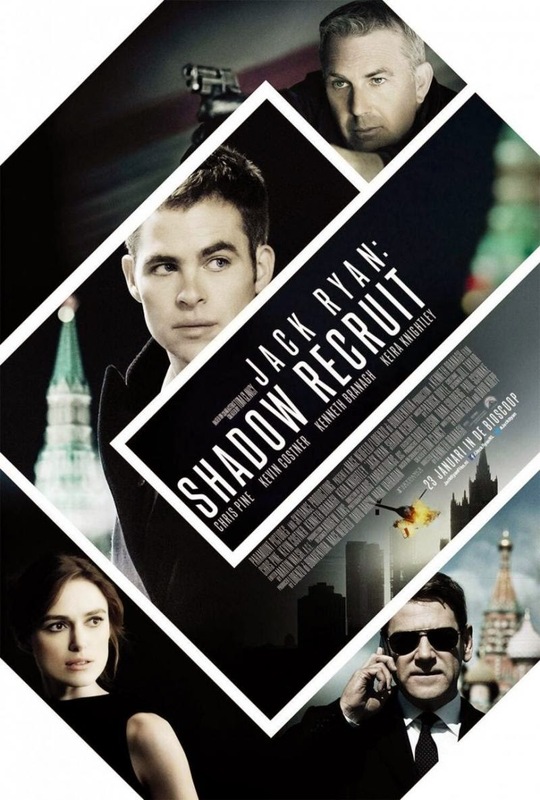 Film Review: "Jack Ryan: Shadow Recruit" (2014). “You're not just an analyst anymore, Jack. You're operational now.” Which is what Jack Ryan: Shadow Recruit offers this summer. This Russian-American action thriller film is directed by and co-starring Kenneth Branagh and featuring the Jack Ryan character created by Tom Clancy. It is the fifth in the Jack Ryan film series and is also a reboot that departs from the previous installments. Unlike its predecessors it is not an adaptation of a particular Tom Clancy novel, but rather an original story. In this scenario, Jack Ryan, as a young covert CIA analyst, uncovers a Russian plot to crash the U.S. economy with a terrorist attack. The film stars Chris Pine in the title role, Keira Knightley as Cathy Muller (Ryan's fiancé), Kevin Costner as Thomas Harper and Kenneth Branagh as Viktor Cherevin, the film's main antagonist. The performances in this film were all superbly acted. Pine stars in the title role, becoming the fourth actor to play Ryan, following Alec Baldwin, Harrison Ford, and Ben Affleck. He delivered a great portrayal of the character, he had the gritty attitude of Ford, the boy scout, good looks of Affleck, but he reminded me the most of Baldwin when the character was introduced for the first time to the world. As Pine's portrayal is to a whole new generation. Pine once again demonstrates what a solid, convincing actor he is. He injected a commanding sense of decency and humanity to the role of CIA analyst Jack Ryan, making it his own. Under taut direction from Kenneth Branagh (who also plays the Russian heavy), Pine is convincing as a character who is pushing papers one day and dodging assassins in Moscow the next. Knightley gave a brilliant portrayal after inheriting the role after Gates McFadden in The Hunt for Red October (1990), Anne Archer in Patriot Games (1992) and Clear and Present Danger (1994), and Bridget Moynahan in The Sum of All Fears (2002). In here we get to see the early stage of the relationship and romance between Cathy and Jack before the latter stages in the previous subsequent films. Costner gave a great performance as the CIA agent Thomas Harper, Jack's mentor. Lastly, Branagh as the film's central villain Viktor Cherevin. He gave a terrific performance as I genuinely felt that he was Russian due to preparation and dedication for the role. He spoke flawless Russian for the role, which amazed me. No wonder why he is one of the great actors and directors of his background and generation. Jack Ryan: Shadow Recruit delights in an almost boyish way in the trappings of power: Russian villains and weapons of mass destruction, flags, ceremonies and political double-speak. However, the film is all plot and not enough characters. The people running around on screen have about as much depth as the sheen of sweat on Chris Pine's forehead. Jack Ryan is not much impressive himself. He's somewhat disgustingly virtuous: a flawless fighter for good and justice, a Superman without the cape. I spent half the movie wondering if this guy was ever going to show anything to mark him as vaguely human. But the film does offer a reasonably sleek and diverting reboot to the long dormant franchise. 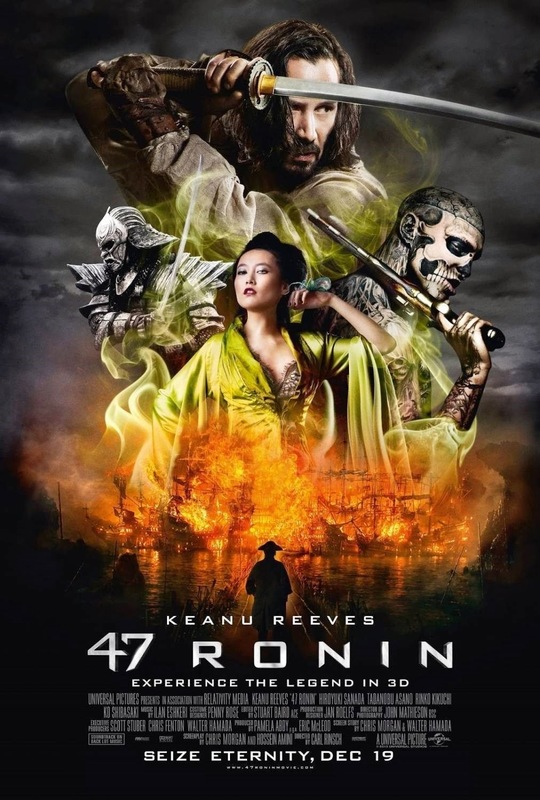 Film Review: "47 Ronin" (2013). From the trailer, we get “Those who have enslaved you, killed our leader and banished us from our land. Join us and we’ll have our revenge.” Which is what we’ll expect from 47 Ronin. This American fantasy action film depicting a fictional account of the forty-seven Ronin, a real-life band of masterless samurai in 18th-century Japan who set out to avenge the dishonor and death of their master at the hands of a ruthless shogun. The film is directed by Carl Rinsch and produced by Universal Studios. The film itself had production troubles from the very beginning, Universal provided Rinsch with a production budget of $170 million, which then escalated by $180 million, due to his lack of feature film experience, which The Hollywood Reporter considered to be a "large-scale, downright risky" move (something that didn't obviously pay off). Then reshoots were done in London during late August 2012, delayed by the Olympics and the filming of Reeves' directorial debut, Man of Tai Chi (2013). During post-production, CleverMovies reported that Rinsch himself was 'booted' from the editing room by Reeves and Universal in order to release the film on time for its Christmas release date. Then came the release dates, the film was originally scheduled to be released on November 21, 2012, then moved to February 8, 2013, citing the need for work on the 3D visual effects. It was later postponed to December 25, 2013, to account for the reshoots and post-production. The film opened initially in Japan, where it grossed an estimated US$1.3 million. Variety called the poor Japanese debut "troubling", considering the well known local cast and the fact that the film is loosely based on a famous Japanese tale. The film went on to gross US$20.6 million in its first five days of release in the United States, opening in ninth place at the box office. The film was widely reported to be a major financial failure, likely to leave a US$175 million financial loss for its studios. The film stars Keanu Reeves, Hiroyuki Sanada, Kou Shibasaki, Tadanobu Asano, Min Tanaka, Cary-Hiroyuki Tagawa and Rinko Kikuchi. Though the cast gave great performances but they were, sadly, disappointing as they were left abandoned by their director within one dimensional roles. Especially Reeves. Better luck next time. Keanu Reeves and Hiroyuki Sanada make for an appealing pair of leads, but they're not enough to make up for 47 Ronin '​s bland script, bloated length, and blaring action overkill. A jumbled botch that is so confused in its purpose and so charmless in its effect that it must be seen to be believed, but better yet, no. Don't see it, don't believe it. In the end, the film is one hot mess—that's for sure. Though it should be praised for its visuals, it is one of the worst films of 2013. 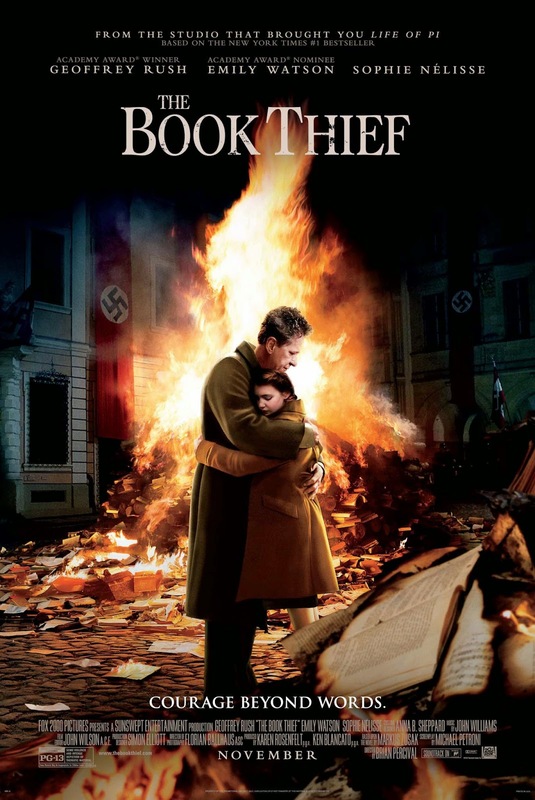 Film Review: "The Book Thief" (2013). From the first view of the trailer, you are asked "If your eyes could speak, what would they say?” Which is exactly what The Book Thief attempts to answer. This American drama film based on the best-selling novel of the same name by Markus Zusak, directed by Brian Percival and adapted by Michael Petroni. While subjected to the horrors of World War II Germany, young Liesel finds solace by stealing books and sharing them with others. Under the stairs in her home, a Jewish refugee is being sheltered by her adoptive parents. The novel is written by Australian author Markus Zusak. The book is narrated by Death, it is set in Nazi Germany, a place and time when the narrator notes he was extremely busy. It describes a young girl's relationship with her foster parents, the other residents of their neighborhood, and a young Jewish man who hides in her home during the escalation of World War II. First published in 2005, the book has won numerous awards and was listed on the The New York Times Best Seller list for over 230 weeks. The film stars Emily Watson, Geoffrey Rush, Sophie Nélisse, Ben Schnetzer and Nico Liersch. The performances in this film were the driving forces in order to compensate for the typical Hollywood trans-mortified plot. Watson gave a great performance as the 'thunderous' wife and mother, Rosa Hubermann. Rush also gave a fine performance as the loving, light-hearted father Hans Hubermann. Nélisse gave the finest performance of all as the film's protagonist and tackling a delicate subject matter as this despite being only fourteen years old. Schnetzer gave a touching performance as the Jewish refugee and friend of Liesel, Max. Liersch also gave a fine performance as childish friend, Rudy. In some ways, The Book Thief is undeniably powerful. The film is a stunning tribute to Zusak’s novel. It’s dramatically moving thanks to its well-acted performances and John Wiliiams’ score. However, it’s a bit too safe in its handling of its Nazi Germany setting, it offends some holocaust survivors, communists and Jews with its lack of authentic portrayal of the Holocaust. What may be most offensive to them is its sidestepping of politics and history in favor of simple human storytelling. But perhaps that impassive quality reflects what director Percival wants to say. By showing Szpilman as a survivor but not a fighter or a hero—as a man who does all he can to save himself, but would have died without enormous good luck and the kindness of a few non-Jews—Polanski is reflecting... his own deepest feelings: that he survived, but need not have, and that his mother died and left a wound that had never healed. It may be one of the best dramatic feature I've seen on the Holocaust experience, so powerful a statement on war, inhumanity and literature's survival. It illustrates that theme and proves that the film’s own love for literature has survived the chaos of that period -- and the hell that war and bigotry once made of it. 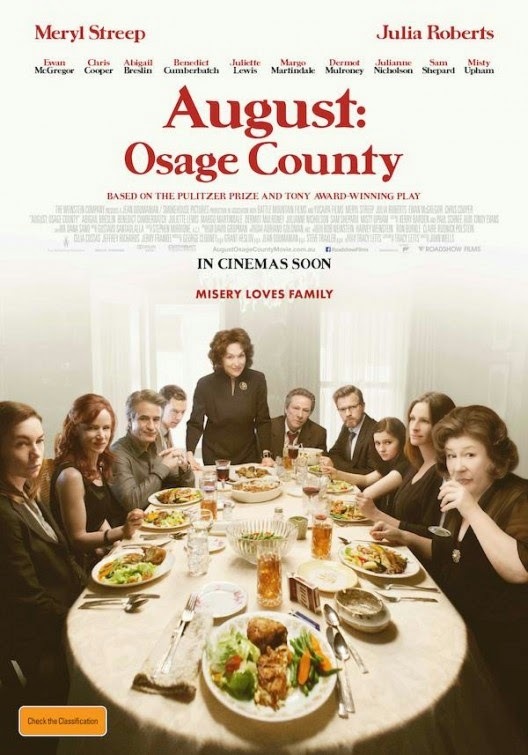 Film Review: "August: Osage County" (2013). "I thought we were having a funeral dinner not a cockfight." Which is what this family reunion is all about in August: Osage County. This American black comedy-drama film written by Tracy Letts and based on his play of the same name. The film is directed by John Wells. The film gives a look at the lives of the strong-willed women of the Weston family, whose paths have diverged until a family crisis brings them back to the Oklahoma house they grew up in, and to the dysfunctional woman who raised them. August: Osage County is Tracy Letts' dark comedic play. It was the recipient of the 2008 Pulitzer Prize for Drama. The play premiered at the Steppenwolf Theatre in Chicago on June 28, 2007, and closed on August 26, 2007. Its Broadway debut was at the Imperial Theater on December 4, 2007 and transferred to the Music Box Theatre on April 29, 2008. The Broadway show closed on June 28, 2009 after 648 performances and 18 previews. The show made its UK Debut at London's National Theatre in November 2008. A US national tour began on July 24, 2009, with its first performance at Denver's Buell Theatre. The ensemble cast is led by Meryl Streep, Julia Roberts, Ewan McGregor, Chris Cooper, Abigail Breslin, Benedict Cumberbatch, Juliette Lewis, Margo Martindale, Dermot Mulroney, Julianne Nicholson, Sam Shepard and Misty Upham. Streep and Roberts gave the most over-the-top and enjoyable performances of their careers as the psychotic mother, with a terrible secret, and the damaged daughter, with her marriage in turmoil. McGregor gave his most dramatic performance of his career to equal the performance of Roberts as her emotionally damaged ex-husband. Cooper gave a great performance as he portrayed the tender loving and kind father figure to Cumberbatch's character. Breslin gave a fine performance as the tormented daughter of Roberts' character. Cumberbatch gave a dramatic and convincing performance as the emotionally distraught and child-like son to Cooper's character. Lewis gave her finest performance since Cape Fear (1991). Martindale gave her finest comedic and dramatic performance as the 'lovable' aunt and the wife with a ‘dirty’ secret about her son. Mulroney gave a comedic performance as the fiancé to Lewis' character and has a ‘sketchy’ plan for Breslin's character. Nicholson gave a fine performance as the more grounded one of the three sisters and has the naive lover of Cumberbatch's character who might find out his and his mother's terrible secret. Shepard gave a fine performance even though his part was only brief. Lastly, Upham, even though her character is the smallest role and has the least amount of lines she has a great acting quality to her that could become a star if she chooses the right roles. It isn't as compelling on the screen as it was on the stage, but August: Osage County makes up for its flaws with Wells' smooth direction and assured performances from the cast, especially Streep and Roberts.